In accordance with the requirements of BS 5266, emergency lighting systems should be periodically tested and inspected to ensure that all luminaries (including signage) function and are positioned correctly. 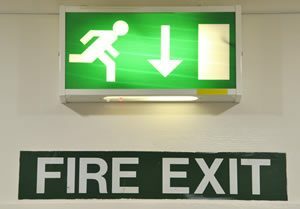 Emergency exit signs must be provided and illuminated. BS 5266, like most British Standards, is not a legal requirement. However, it can acquire legal status by being adopted as part of the bye-laws. Although most enforcing authorities quote BS 5266, many modify the conditions e.g. they may insist on a higher luminance. In addition to this legal requirement, many organisations have their own more onerous standards. Therefore, the designer must thoroughly investigate the standards that apply to the building. All exits and emergency exits must have exit or emergency exit signs. Where direct sight of an exit is not possible, or there could be some doubt as to the direction, then direction signs with an appropriate running man pictogram and the words exit or emergency exit are required. 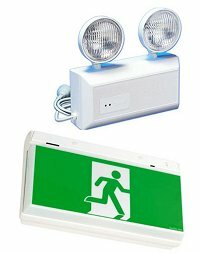 There are a variety of emergency exit signs from standalone, backlight illuminated or LED illuminated. The idea is to direct someone who is unfamiliar with the building to the exit. All of these signs must be illuminated at all reasonable times so that they are legible. Exit signs need to conform to new EU regulations. Emergency lighting should be periodically checked to ensure compliance and satisfy safety and insurance policies. The minimum illuminance along the centre line of a clearly defined escape route should be 1 Lux. The emergency lighting must reach its required illuminance 5 seconds after failure of the main lighting system. If the occupants are familiar with the building, this time can be increased to 15 seconds at the discretion of the enforcing authority. Luminaires should be located near each exit door and emergency exit door and at points where it is necessary to emphasise the position of potential hazards, such as changes of direction, staircases, changes of floor level and so on. Fire fighting equipment and fire alarm call points along the escape route must be adequately illuminated at all reasonable times. Door closers are required to alleviate the spread of fires in large corridors and specific areas forming part of the escape route. Offices, supermarkets, dining halls, churches, conference rooms, laboratories, multi-purpose rooms – these places will not have defined routes and the layout of furnishings may change from time to time. The average horizontal luminance over the whole area on the unobstructed floor should not be less than 1 lux. Emergency lighting luminaries are required in all control rooms and plant rooms. In toilets of over 8 sq. metres gross, emergency lighting should be installed to provide a minimum of 1 lux. Areas containing rotating machinery, etc. In these areas, emergency lighting should be provided at 10% of the normal luminance level or 15 lux, whichever is the greater. BS 5266 specifies the use of the plain EXIT legend, however, European legislation now calls for ‘running man’ pictograms. During the transitional period, up to Jan 1996, there was no requirement for the UK to change all installed exit boxes, however any additionally required exit signs within the same building must be of the same format. After this date the running man pictogram is now mandatory, with the requirement of a global change in all buildings. Our emergency lighting lighting installations have been carried out for Fife Council, West Lothian Council, Angus Council, Diageo, Royal and Ancient Golf Club.